Authorities are looking for a man in a suit who fled with bags of cash after a shootout during an armored car heist in the Bronx Tuesday, a law enforcement source says a preliminary investigation shows. 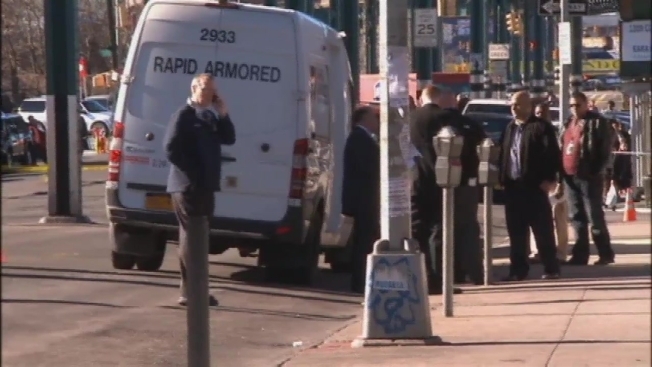 The source says an armored car guard was loading about $78,000 into the vehicle on Westchester Avenue in Soundview around 11 a.m. when the man in the suit walked up, pulled out a gun and demanded money. Another guard was in the car. A shootout ensued, the source says, but no one was hit. As the guards, still firing, drew back for cover, the man in the suit grabbed bags of cash and ran off. A block away, he jumped into a red Honda and the vehicle sped away, the source says. Jocelyn Sandoval was inside a nearby check cashing business when she heard gunfire erupt. She said she and other terrified customers hit the floor. "We thought they were going to come inside," Sandoval said. "I'm still shaking."